◎Nikko & "Nikkorisou" is a very quiet and peaceful place. ◎Winter season is extremely cold here!! Please pack accordingly and come prepared for a lot of snow. Walk down the road and "Nikkorisou" is on your left. The bus fare is around 200JPY. Our hostel is about a 25 minute walk from the Tobu/JR station. We will do our best to ensure that you have a good time staying at Nikkorisou. There is a 2 day unlimited Tobu-bus pass is available for purchase at the Tobu Nikko Station and JR Nikko! You can take the bus from Shinkyo no.7. (the nearest bus stop) to these sites. We recommend you get a bus ticket when you arrival at the station. 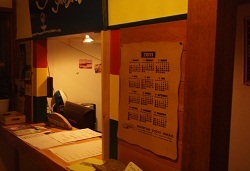 ※However, depending on the time of arrival. in the room assumed to be spacious. and it is always bright. Have a good time getting to know other female solo travelers. ♪. You can see Shinkyo bridge. This room is first floor. Big room with KOTATSU. You can experience living like a Japanese person. ・Quiet hour starts at 11:00 PM. ・300yen extra charge is added winter season (November-April) for heating oil fee. ・All prices are per person and are in Japanese yen and includes tax. ・Please take care of your valuables as it is not our responsiblity to keep them for you. There are lockers in all the rooms that you can use. Make sure to bring your own lock.